the Vedic personification of Saturn. Saturn is the most distant planet from the Sun, with the exception of Uranus and Neptune. The duration of one Saturnian year, that is one orbit around the Sun is, twenty nine years, one hundred and sixty seven days and five hours. The NASA Cassini-Huygens mission was launched to explore the mysteries of this uniquely ringed planet and it's many moons. Saturn is the 6th planet in the solar system and has 53 and counting, moons. In astrology, Saturn signifies justice, prudence, concentration and caution, however the negative aspects of this planet cause obstacles, delays and isolation. In a negative context, Saturn brings delays that can lead to despondence and hopeless and therefore, in some ways, Saturn is an indicator of the degree of success that one may achieve in life. Saturn is a hard taskmaster and judges us for our actions of this and previous births. This justice is dispensed through the seven-and-a-half year long negative transits of Saturn that we all must undergo, usually three times in a lifespan. The influence of Saturn is most dominant during the first thirty years of a person's life and after the sixtieth year, that is during some of the most important years of life. Saturn represents diseases which proceed from cold and obstruction, such epilepsy, toothache, jaundice, cold defluxions, catarrh, phthisis, atrophy, clinical depression, fistulas, apoplexy, dropsy and leprosy. When Saturn is the lord of fate, nothing comes easily and many struggles will have to be endured before there is success. But, Saturn bestows determination and the moral strength to overcome obstacles. However, if Saturn is a debilitated ascendant's lord, a person can become beaten by struggle, melancholic, depressed, pessimistic, bitter and take a prejudiced view of life. Patience, diligence, sincerity and an industrious nature are the virtues that Saturn brings. However, people under a strong influence of this planet should guard against taking life too seriously and assuming too much responsibility regarding the destiny of others. They will do well to select partners, business associates or friends who have an optimistic attitude towards life and are less seriously minded than they are. Those born under a strong influence of Saturn will learn to cultivate patience. In life they are often likely to encounter one obstacle after another and their success will only come through hard work and often after some delay. They are inclined to endure difficulties, rather than effect a change, due to a fear of disappointment. They resolutely hold on to old customs and traditions, although in some respects they are progressive and optimistic. Saturnians have a tendency to be sympathetic towards elderly people, while the older they grow, the younger they will be in their attitudes. However, they may often find it difficult to get comfort from others because of their natural inclination towards solitude, although at heart, they desire love and sympathy. One of the strongest effects of Saturn is the tendency to give up just as things are taking a turn for the better. They can be unnecessarily pessimistic and this will lead to many a lost opportunity. When Saturn is in an elevated position in a horoscope, it causes a person to rise in life and brings a position of power. However, if this power is used selfishly, there will be a downfall, in such a position a person must avoid becoming power hungry. A debilitated Saturn can deny one the benefits of parental happiness, as one's parents can be taken away early in life. People under a strong influence of this planet are self-made and success usually comes after the age of thirty. A true Saturnian is always economical, has a natural aversion to wastefulness and undue extravagance. He/she will strive to succeed through persistency, perseverance, punctuality and with attention to detail. If however, the influence of Saturn is not favourable, the person can hold a narrow outlook on life, they may meet with one misfortune after another and may not be able to escape the law of cause and effect. The influence of Saturn can be corrosive, hindering and retarding, nevertheless it is also a crystallising and constructive force when used unselfishly. Saturnians have a strong sense of self–preservation and they may at first sight, appear to be sympathetic towards pain and misfortune, because of their own misfortunes. In Sanskrit the Saturn is called 'Shani' or 'Shanaishcharya' and these names are used in Vedic astrology. Saturn is of a servile nature and serves others. It signifies discipline and order, seriousness, diligence, conservatism, discretion, obedience, faithfulness, longevity, prudence, carefulness, violence, economy, slow change/progress, stubbornness and patience. Saturn also denotes learning the hard way and judgement for deeds in a previous birth. It is the lord of Capricorn and Aquarius. It is exalted in Libra, and debilitated in Aries. The ailments associated with Saturn are gout, rheumatism, leprosy, epilepsy, fistula, melancholia, stammering, deafness and dumbness. It's colour is black or dark blue. 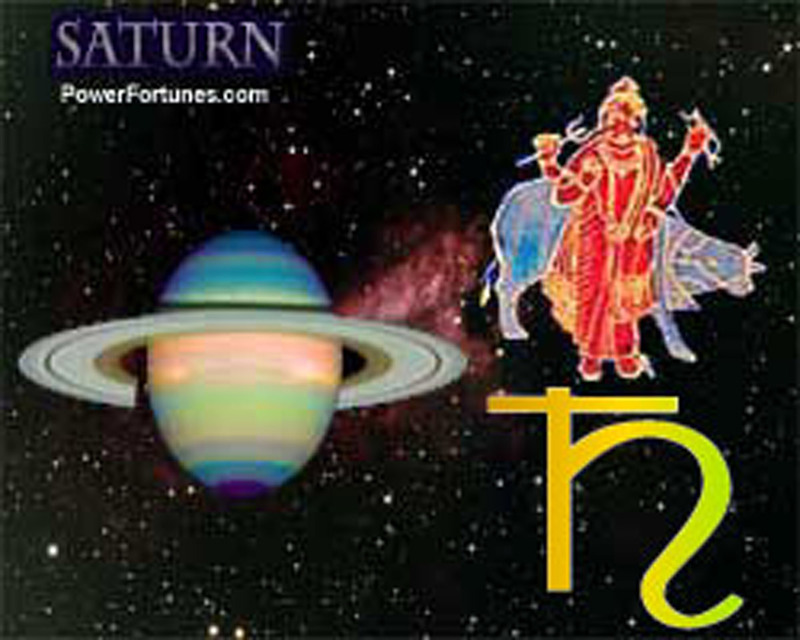 According to numerology, Saturn's number is '8'. It represents iron and it's corresponding gemstone is the blue sapphire. It is the lord of the winter season. The direction associated with Saturn is, West.